﻿﻿﻿﻿﻿﻿﻿﻿﻿﻿﻿﻿﻿﻿ "Speed up," I tell my husband. We are closing in on a silver mini-van. I push the imaginary gas pedal from the passenger side, hinting that my husband is driving too slow. "We are going to lose them." He speeds up and soon we are neck and neck with the van, both cruising towards a red light. Bingo! ﻿﻿﻿﻿ As both vehicles idle at the light, I turn to check out the other driver. It's a round woman with too tight ringlets in her hair and a dour face. Her cheeks are flushed and her mascara is running. She looks pissed off. Maybe it's because we've been chasing her down for the last ten minutes. She doesn't look at me, even though I'm waving cheerfully out the window. She has two young children in the backseat, who appear to be arguing. As soon as the light turns green she hits the gas and speeds off. "Well, that was a disappointment," I tell my husband, who pulls into the McDonald's drive through for an ice cream cone. "It generally is," he agrees. What initiated our car chase was the stickers on the rear windshield of her mini-van. It was a set of those cutsie, white, stick-figure families. There was daddy stick figure in a chef's hat. Mommy stick figure, a lean woman with a big smile and a briefcase. Two children's stick figures, one with pom-poms and one with a football. And Doggy stick figure, sitting obediently by an empty bowl. I had been desperate to find out if the people in the van matched their stick figure counterparts. But once again, I came up empty. "Why do you think people do that?" I asked my husband, who was driving with one hand and holding his ice cream with the other. "I mean, why lie about your life?" "Maybe they see things differently." "Maybe," I agreed. "Or maybe they just want to present an image to the world that isn't accurate. Maybe they think that if that's who they present themselves to be in fantasy-land, that's how people will perceive them in reality." Daddy stick figure is always first. Even though it's most likely mommy's car as she is usually the one driving. Mommy stick figure is always thin. And happy. There are no flawed figures or under eye circles in stick figure land. Kiddie stick figures are always playing sports. They are never fighting. None of them are wearing baggy pants or skirts three inches too short. Pet stick figures never do a no-no on the back windshield. It just doesn't happen. 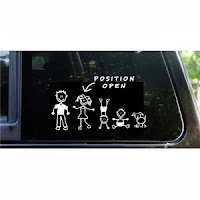 Mommy stick figure has a swollen belly and dark circles under her eyes from trying to work, get the kids to school, and still have time for daddy. She stares absently ahead from lack of sleep. Daddy stick figure comes with a remote control in one hand and a beer in the other. Kiddie stick figures are armed with Smart Phones and Ipods, and they sit on the other side of the windshield, ignoring everybody. Doggy stick figure begs for food while trying to mount the family stick figure cat. I thought about buying my own cutouts, just to place on my windshield for shock value. I was going to put a Mommy stick figure surrounded by seven Daddies. Every daddy would have a different role, attending to mommy's every need. In this scenario mommy's smile really would be warranted. But as I proceeded to pay for the stickers I chickened out. Who knows what someone with an inflated sense of morality and no sense of humor would do to my car? It's the same reason I won't put the fish with the little legs on my vehicle. For now, I'm content to just chase down these mini-van billboards hoping that someday, the image will mirror the reality. The first time I see all five members of the family, in their corresponding gear and with happy smiles pasted on their faces, I will shut up about the whole thing. I'm glad you liked that Sarah. Thanks for leaving the comment!